We all possess a gift. A gift that God can use to bless others. I cannot be so modest as to deny the gift God has made evident in my life. My gift is creative design. I have served as a Children Minister alongside my wife for over 20 years. During this time I have created some pretty amazing sets for Children’s Church, Vacation Bible School, church functions and other. You can see some of my work HERE. I currently serve as an Associate Pastor and even though I have been inspired to write quite a few creative sermons, I have never considered myself a writer per se. It wasn’t until recently, after being encouraged by my precious wife, Maribel, that I decided to venture into the blogging world. Mari’s encouragement and praises have given me the confidence to write and share what has been stored in my heart for many years. I love lighthouses. I collect them, have visited over a dozen of them, and plan to visit many more before I enter eternity. I even bought a Lighthouse Passport that is stamped at every lighthouse I visit. For years, I have been fascinated by their architectural design, but mostly by their purpose. My dream is to one day own a lighthouse or at least live in a house where my “man cave” is designed to resemble one. Lighthouse Devotions is intended to reflect the peace, the strength, and the hope I experience in the presence of lighthouses. But these inspirations would be meaningless if they did not bring glory, honor, and praise to One who is the true beacon of the world, my savior Jesus Christ. I dedicate this blog to my wife and I sit here humbly asking God to use these inspirations to encourage other lighthouses (believers) to shine the light of Christ in a spiritually dark world. Praying for you, your wife, and your ministry! God loves you! Thank you, Gail, for your prayers and encouragement. 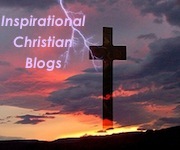 May the ligth of Jesus shine ever so brightly through you and your blog. Blessings upon you and your family. PTL! 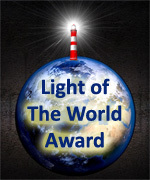 The Lord used you to send me a little of His light my way through Brooke of Noes to Knows when she nominated me for your Light of the World Award. By God’s generosity, I was able to share some of that light with others. God bless you and your blog! It’s all about Him, so it is blessed already! Thank you, Deborah, for shining His light in a dark world. May His light brightly shine through and in you every day. Well, thank you, Linda! I will definitely accept and respond. Thank you for stopping by and for your encouragement! Blessings to you and may you continue to “light up” the world through blogging! God bless you and continue to use you!